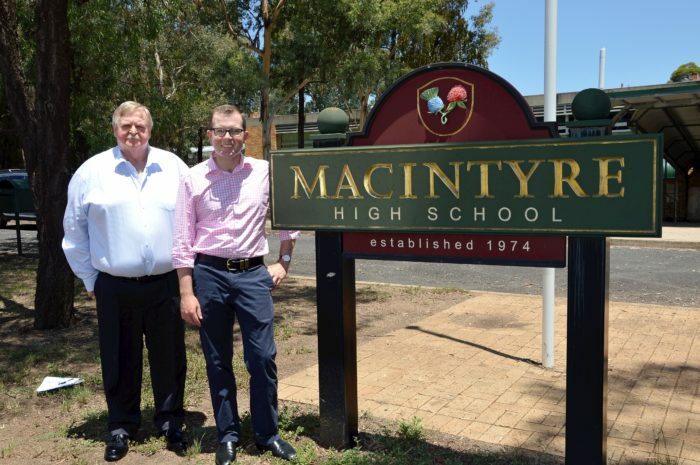 MACINTYRE High School will remain a hive of activity these summer school holidays, as tradies arrive to spruce up some of the school’s buildings while students and teachers are on leave, Northern Tablelands MP Adam Marshall announced today. Mr Marshall said $703,380 was being spent to replace the roofing on school classroom blocks A, B and D, with the work to be completed before school returns for 2019, in early February. “Every child deserves to have access to great facilities, wonderful teachers and get an excellent education and that is what is being delivered for students here at Macintyre High School,” Mr Marshall said. “Every single job, no matter how big or small, matters. Keeping our local schools in tip-top condition promotes a sense of pride in our schools and this improves teaching and learning. Mr Marshall said this program was another example of how the State Government was committed to public education and delivering local infrastructure to support communities right across NSW. “Just like your family home, there are always jobs to be done to keep our schools in top condition,” Mr Marshall said. The summer holiday blitz is part of the NSW Government’s record $847 million school maintenance investment over the next four years. The NSW Government is investing $6 billion over the next four years to deliver more than 170 new and upgraded schools to support communities across NSW along with a record $500 million to provide air conditioning in schools. This is the largest investment in public education infrastructure in the history of NSW.